Discontinued, a Comedy Dynamics special is set to premiere on The CW Network December 16, 2018 (9:30pm-10:00pm ET). 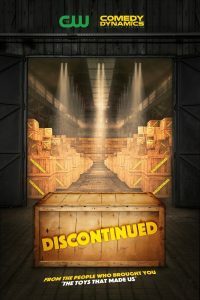 Discontinued is a funny and informative look at the world’s most famous – and sometimes infamous – discontinued foods, toys, customs and businesses. Set in a mystical warehouse, YouTube star and self-proclaimed “black nerd” Andre Meadows takes viewers down memory lane recounting the rise and fall of these fallen pop culture titans, with the help of surprise special guests, “insider” experts, and a bevy of hilarious comics. Creator, and director of the show Brian Volk-Weiss, alongside executive producers Robin Henry and Cisco Henson, brings this homage to nostalgia from the same people behind the Netflix hit docu-series The Toys That Made Us– a series featuring the minds behind history’s most iconic toys franchises that discuss the rise and fall of the industry’s billion dollar creations. “It’s been a joy and honor working with The CW to bring to life a show that I’ve wanted to make for a very long time. Prepare yourselves for a whole lot of nostalgia bombs!” said Brian Volk-Weiss, CEO of Comedy Dynamics. Comedy Dynamics, a Nacelle company, is one of the largest independent comedy production and distribution companies, producing Kevin Hart’s Guide to Black History, Animal Planet’s Animal Nation with Anthony Anderson, the new scripted comedy on Hulu, There’s… Johnny!, History’s Join Or Die with Craig Ferguson, MTV2’s Wild ’N On Tour, and Hulu’s Coming To The Stage. In 2018, Comedy Dynamics began releasing original films in theaters starting with the acclaimed documentary Poop Talk. The company has worked with a wide range of established and emerging comedic talent including Tiffany Haddish, Kevin Hart, Aziz Ansari, Jim Gaffigan, Katt Williams and many more. In total, 12 of Comedy Dynamics’ releases have been Grammy-nominated, with two wins. Spun off in 2017 by Brian Volk-Weiss, The Nacelle Company develops, produces, and distributes feature and documentary films, TV shows – both scripted and unscripted. Nacelle’s vast array of partnerships include: Netflix, HBO, Discovery, A&E Networks, Hulu, Amazon, Viacom, and many more. Via its renowned video and record label, Comedy Dynamics, established in 2007, Nacelle is one of the largest independent producers and distributors of comedic television, film, and stand up comedy. The Nacelle Company is also responsible for the production of the hit Netflix docu-series, The Toys That Made Us. THE CW TELEVISION NETWORK launched in 2006 as America’s fifth broadcast network, with programming targeting younger viewers, a demographic highly sought after by advertisers. The CW, a joint venture between Warner Bros. Entertainmentand CBS Corporation, broadcasts a six-night, 12-hour primetime lineup, Sunday through Friday. The CW’s primetime programming is also available to stream for free, without authentication, on the ad-supported cwtv.comand The CW app, now available on every major OTT platform. In daytime, The CW broadcasts a Monday through Friday afternoon block, and a three-hour Saturday morning kids block. The CW’s digital network, CW Seed, launched in 2013, and offers original short-form digital content as well as past seasons of fan-favorite television series. For more information about the network and its programming, visit www.cwtvpr.com.